Bjoern Werner isn’t revealing any secrets. He knows that in the next few days Werner will have to stand in front of his Colts teammates and sing a song that will inevitably invoke a room full of laughter. What might the song of choice be? “It’s a surprise,” Werner said with a rye smile. 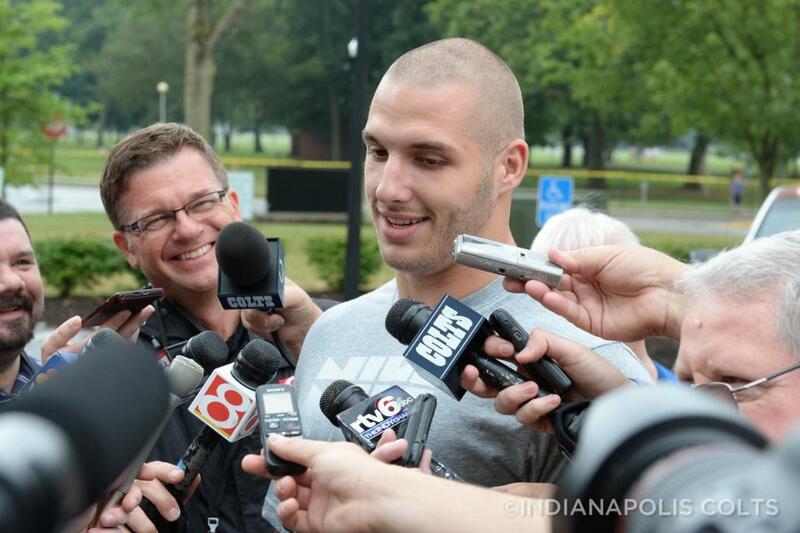 That smile is the same one the Colts have seen for the three months that Werner has been in the NFL. The rookie is simply happy to be playing professional football and while some veterans dread the three-week training camp, Werner could not be more thrilled. “It’s my first time that I have to go somewhere for training camp. That’s something new to me right away,” Werner said. Earlier this week, Werner signed his rookie contract and while there was never a doubt it could get done prior to training camp, the Colts first round draft pick is happy to have it done. Can Werner make the transition to a new stand-up position? Will he be more of a third-down pass-rushing specialist? Is Werner better suited for the RUSH or WILL outside position? Speaking with Werner on Saturday would indicate that those questions are the least of his worries. “Honestly, I have no expectations for myself,” Werner said.